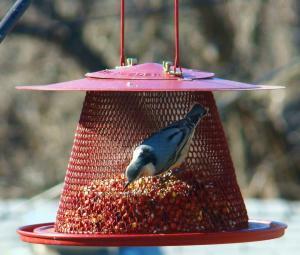 People have been feeding birds for centuries, so it's not surprising that the basic design of bird feeders hasn't changed much'until No/No Wild Bird Feeders. 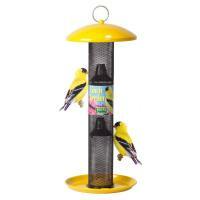 No/No feeders are a completely new concept of feeders that have no plastic and no wood. 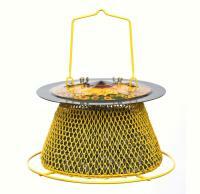 The steel feeders are collapsible wire baskets that hold seeds and accommodate perching and clinging species. No/No feeders are so novel because they're long-lasting, easy to clean, weather-resistant and environmentally friendly. 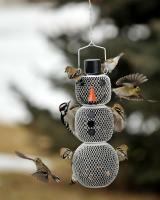 Few other bird feeders match the innovation and simplicity of No/No feeders. This is a good feeder! 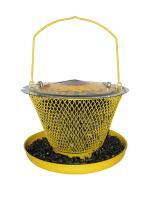 Easy to fill and very durable! I'm not convinced that cardinals are attracted to the red color because I don't have many that visit the feeder. I thought it would be bigger. But the squirrels and tree squirrels can still get into the seeds. I love it for its appearance and the amount of seed it holds. It does attract the beautiful cardinals. Unfortunately, it took the squirrels about an hour to find it and they love it too. It seems I have more squirrels than birds feeding from it. About to give up. 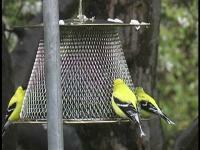 This feeder is great! The pair of cardinals in our neighborhood come every day. I can't say enough good things about the feeder. It's hanging outside my window so I can watch the variety of birds that come everyday. 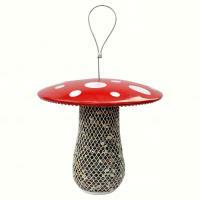 It's sturdy, holds plenty of seeds and is big enough for many birds to feed at the same time. 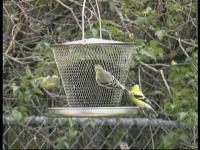 Plastic feeders don't last one season. This one will. 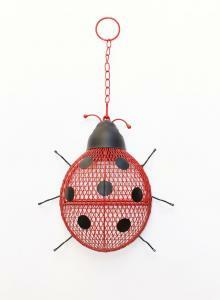 I am extremely pleased with my No-No bird feeder. It does exactly what it's advertised to do: attract cardinals and other song birds. It repels squirrels because they can't get access to seed. I also find there is very little waste or mess because the birds are basically able to get the seed they can peck at without scattering whatever they don't like all over the ground or bushes around the feeding area. I feel it was money well spent and I have recommended it to other friends and family who are bird watching enthusiasts.